New York City Occupy Nukes march emerges from the subway. © Tracie Williams, all rights reserved. Occupy Nukes demonstrations were held in towns and cities across the United States on Monday, marking the anniversary of the atomic bombing of Hiroshima on August 6, 1945. Approximately 140,000 civilians were killed by the bomb, code-named Little Boy, while hundreds of thousands died later of cancer, and thousands more inherited birth defects. Nothing before or since has approached the instantaneous and horrific carnage reaped by Little Boy except, perhaps, Fat Man, dropped on Nagasaki three days later. Bearing a banner that read “¡Ya Basta! (un)Occupy The Bomb!” at least six people in New Mexico were arrested as a crowd of roughly 50 demonstrators, periodically throughout the day, blocked an entrance to Los Alamos National Laboratory (LANL). Occupying what was once Pueblo land and the home to 2,000 archeological sites, LANL is the birthplace of the atomic bomb. To this day, secretive weapons experiments are carried out at the lab. Megan Rice, an 82-year-old Catholic nun and peace activist set the stage for Occupy Nukes by putting out the initial call for the national disarmament demonstrations and working with various Occupy working groups to organize it. She missed the day herself, however, resting since her release from federal custody. Rice and two other activists were detailed by federal authorities last week after they infiltrated the Pentagon’s Y-12 National Security Complex in Oak Ridge, Tennessee. Before dawn on the morning of July 28, Megan and company spray painted “Woe to the Empire of Blood” and called for ending the new construction within the inner perimeter of the uranium enrichment site before they were apprehended. The Oak Ridge facility has since gone into temporary shut down mode to focus on security concerns. The day of action comes amid President Barack Obama’s efforts to expand the U.S.’s nuclear arsenal. According to a White House fact sheet, Obama is pushing for investments of $80 billion “to sustain and modernize the nuclear weapons complex,” and $100 billion to revamp “existing capabilities and modernize some strategic [delivery] systems” by 2020. This nuclear spending spree includes $4 to 12 billion for a new plutonium processing complex at Los Alamos. 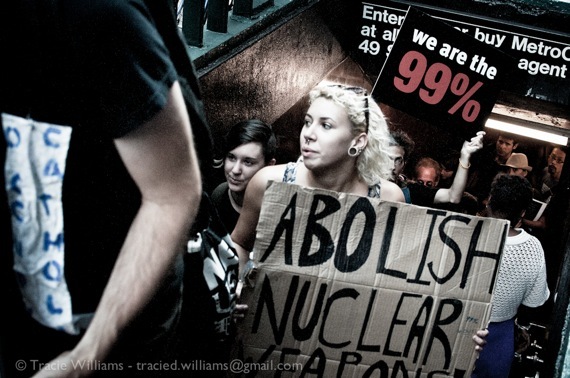 “Money spent on nukes is irradiating social programs for the 99 percent,” warns Occupy Nukes. We cite a Brookings Institution study which notes that between 1940 and 1998 the U.S. spent more money on nuclear weapons — $5.5 billion — than the “combined total federal spending for education; training, employment, and social services; agriculture; natural resources and the environment; general science, space, and technology; community and regional development, including disaster relief; law enforcement; and energy production and regulation.” That figure reached 7.2 trillion by the end of President George W. Bush’s term in the White House, and we accuse Obama of charting the same costly nuclear course. So called ‘safe,’ ‘civilian’ nuclear technology is used to justify the fossil-fuel intensive mining of uranium in some of the worlds most economically decimated regions, in country’s such as Romania and Niger, and on indigenous lands in South Australia and the American West. Continued reliance on nuclear power has led the people of earthquake-prone Japan to experience the radioactive horrors of Hiroshima and Nagasaki all over again with the continuing disaster at the Fukushima-Daiichi plant. Occupy Nukes demonstrators in the Bay Area and New York City drew links between nuke weapons and nuke power. Dressed in hazmat suits, activists rallied at the Japanese Consulate in San Francisco and marched to the headquarters of Pacific Gas and Electric Company (PG&E), operators of nuclear reactors at Diablo Canyon. Diablo sits on two earthquake faults and jelly fish have been known to clog the plant’s intake valves and knock it offline. Like all nuclear plants in the United States, Diablo was only built to last 30 years, and, like many nuke plant operators in the last few years, PG&E has applied for relicensing. On Monday, demonstrators accused the corporation of putting California at risk of a Fukushima-style meltdown and called for the shuttering of Diablo. At Rockefeller Plaza in Manhattan, Occupy Nukes activists staged a melt-in at the headquarters of General Electric. The world’s biggest company (and its biggest tax dodger) was, since its initial participation in the Manhattan Project at Los Alamos, the world’s largest supplier of nuclear weapons technology. That changed after a decades-long boycott and direct-action campaign caused the corporation to withdraw from the business of making the weapons of mass destruction in 1993. But that doesn’t mean GE is out of the nuke field for good. GE has planted its reactors like gravestones all over earth. The reactors that melted down at Fukushima bore the GE logo. This month, the U.S. Nuclear Regulatory Commission will decide whether to grant GE, along with its Japanese nuke partners Hitachi, as well as Canadian and Australian interests a license to build a uranium enrichment facility in Wilmington, North Carolina. The plant will utilize laser technology that makes uranium enrichment nearly as quick and easy as turning on a light bulb. Consequently, it is also “particularly suited for nuclear proliferation,” as Scott Kemp — a former top science adviser in the State Department’s arms control unit — wrote in the latest issue of the Bulletin of the Atomic Scientists. At flag-lined Rockefeller Plaza approximately 150 Occupy Nukes let out a collective howl, then fell to the marble floor. They wore all black to symbolize the charred outline of bodies imprinted on the streets of Hiroshima and Nagasaki by the atomic bomb in 1945. Only the walkie-talkies of surrounding security personnel could be heard in the normally buzzing tourist hub. Afterwards demonstrators arose and sent chants of “shut down, not melt down” ringing through the streets of midtown and the pathways beneath the plaza, stalked all the way by GE security and police. The grassroots struggle against the nuclear-industrial complex in the U.S. is beginning to grow again, as evidenced by Occupy Nukes. This fall, the new anti-nuke movement should find its greatest expression since the height of the disarmament movement in the early 1980s, as thousands from across the country are expected to converge on Washington, D.C., to call for a future free of uranium mining, nuclear weapons, nuke plants and nuke waste. If inspiration is coming from anywhere, though, it’s from Japan, where hundreds of thousands have taken to the streets in recent weeks against the re-ignition of reactors. The Japanese no nukes movement may even be approaching the critical mass needed to move the country off nukes for good. Close to 80 percent of the population favors a phase-out and the former prime minister, who stepped down after his government’s mishandling of the meltdown, is pushing for legislation that would accomplish just that. Such a move would go a long way toward showing the ability of people power to disarm nuclear power and help point the way not only to a world free from the fear of another Fukushima or Hiroshima, but also a world where human health and safety is the priority above all. Aug. 6 – Six anti-nuclear activists were arrested at around 8 am today after blocking the road into Los Alamos National Laboratory. The action took place on the 67th anniversary of the nuclear bombing of Hiroshima. At least 50 activists from Trinity Nuclear Abolitionists, (un)Occupy Albuquerque, Occupy Santa Fe, Nuke Free Now and other groups participated in the protest. Cathie Sullivan of Santa Fe, who was one of those arrested, said today’s action was a culmination of 40 years of moral objection to nuclear weapons. Pamela Gilchrist, who fasted for 21 days against the ongoing nuclearization, said she hoped that her arrest would motivate citizens to get involved in stopping the Chemistry and Metallurgy Research Replacement (CMRR) facility. “I’m outraged that our senators (Jeff Bingaman and Tom Udall) are trying to revive the ill-fated and ill-advised CMRR project,” she added. The CMRR would enable the lab to increase plutonium pit production. Benjamin Abbott was also arrested as part of today’s action. “I took part in the action to throw a wrench into the gears of the war machine. I oppose all weapons and military research that support U.S. imperialism across the world and the occupation of LANL,” Abbott said. The arraignment will take place at the Los Alamos Justice Center on Aug. 9, which also marks the 67th anniversary of the bombing of Nagasaki. And we all together keep our eyes on the prize “Transform Now” for life-enhancing alternatives: minds and hearts, economies, industries, education, jobs…… military appropriations, obedience to just law: US Constitutional, International Laws, treaties, charters. We are all responsible actors in this equally in each way we are able, NOW. At Y-12 a group of us also attempted an all night occupation between the time our vigil formally ended with reading the Mayor of Hiroshima’s statement and dawn when we had scheduled a Names and Remembrance Ceremony for the victims of Hiroshima. We lasted until 10:30 when after communicating with and receiving conflicting messages from the plant security we were told we would be arrested if we didn’t leave.